Abby Schnable | The Phoenix Junior guard Bruno Skokna guards against Niagara University. 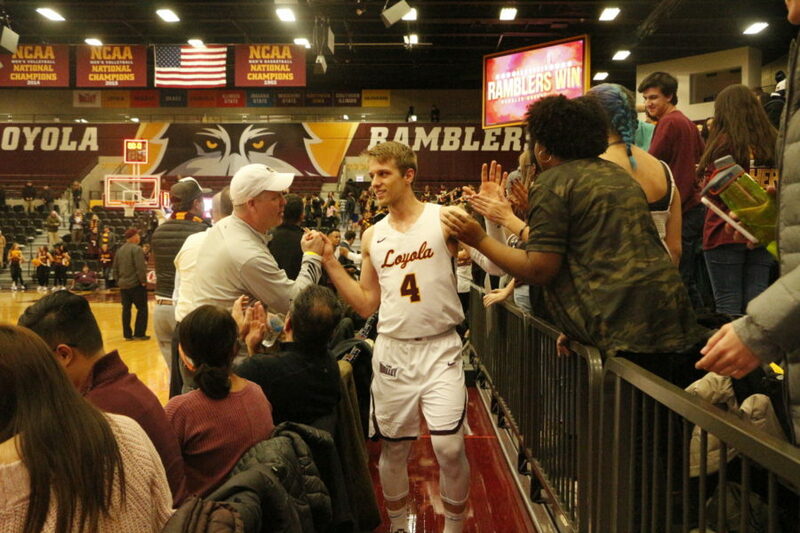 Ever since sophomore guard Lucas Williamson broke his hand against University of Nevada Nov. 27 and then re-injured it against Indiana State University Jan. 19 there’s been a hole on the Loyola men’s basketball starting lineup. 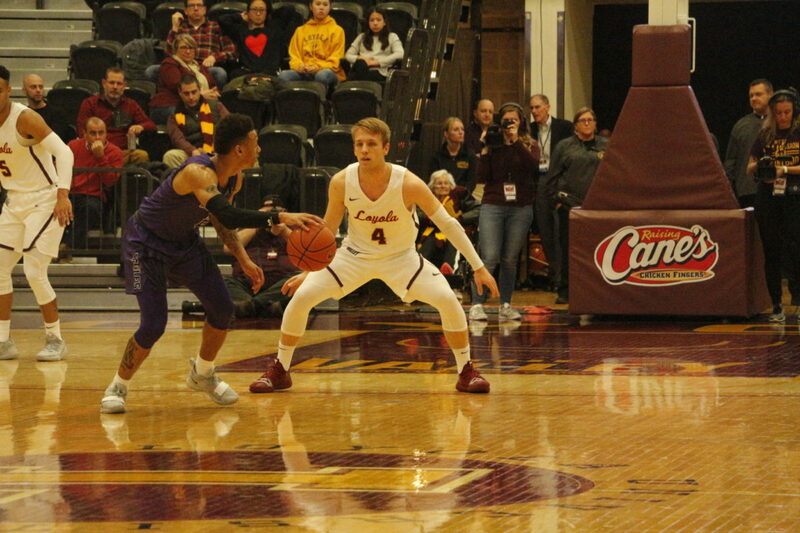 Head coach Porter Moser tried to fill the role with first-year guard Cooper Kaifes, but ultimately decided it wasn’t the right fit. Enter junior guard Bruno Skokna. In his first two years, Skokna has struggled to find his footing on the team. His new starting position hasn’t fixed all his problem areas, but it’s starting to show improvement for the finance major. When he starts, he plays 25.5 minutes per game and averages 3.5 points per game. It’s a small jump from his 15 minutes and 3.1 points per game from the bench. So, while there’s an improvement from before, he’s still no Williamson. Abby Schnable | The Phoenix Junior guard Bruno Skokna follows through on a shot. In Skokna’s first start of the conference season, his performance wasn’t what it could’ve been. He only scored two points, shooting 1-5. He had two rebounds and two assists, but nothing close to sophomore center Krutwig’s 22 points in that game. Despite the struggles, Skokna is shooting better than usual in Williamson’s absence. When Williamson was still in, Skokna shot at a 24 percent clip from the field and 15 percent beyond the three-point line. Without Williamson, he’s shooting 40.1 percent from the field and 21.4 percent from beyond the arc. Moser said Williamson’s injury has allowed Skokna to step up and be more confident. He’s been able to fill some of the hole Williamson left, as well as show some of his talent. Skokna said his starting role has brought him the assurance he hasn’t been able to find before. Despite being in his third year on the team, he hasn’t really hit a consistent stride. He said he has yet to find as much success as he wants on his shots, despite knowing he can hit those shots and hits them often in practice. Abby Schnable | The Phoenix Junior guard Bruno Skokna claps hands with fans after game. His best game to date was against Norfolk State University Dec. 9, 2017. He scored a career-high 18 points and was good both offensively and defensively — even though he usually struggles with shooting. Despite his lack of consistency, Skokna said he remains motivated to help the team do its best. 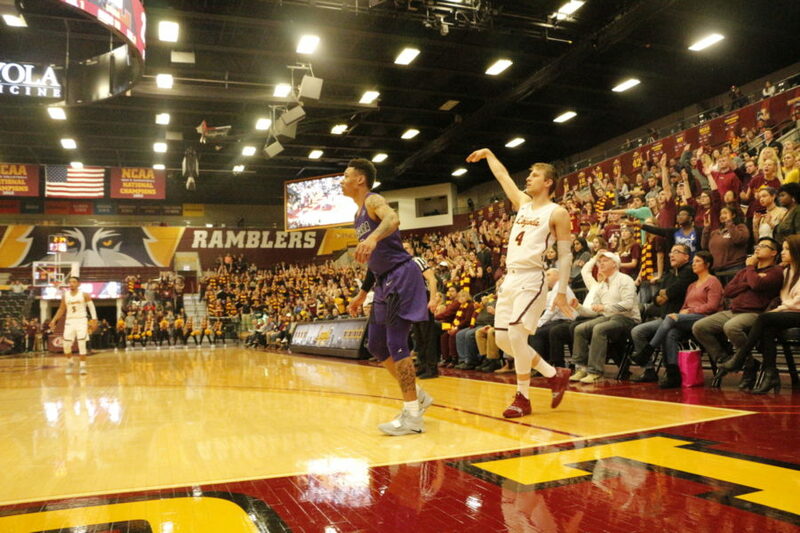 Skokna and the Ramblers are scheduled to play Bradley University for the first time this season Feb. 13 in Peoria at 7 p.m. The game will be broadcasted on NBC Sports Chicago.